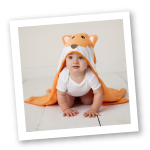 Hudson Baby Security Blanket features super soft and luxurious fabric that is soothing to the touch, with an attached animal character to keep baby company when separated from parents at day care, playpen time, or to entertain on car rides. Security blankets help your little one transition to independence, and comfort the child who isn't yet aware that mom and dad exist when not in sight. Acting as a symbol of mom or dad, security blankets provide baby with a tangible link when separated, often taking on the scent of the parent and being associated in the baby's mind with being held, nursed, fed, and comforted.